Hand painted Batik Sarongs from Bali Indonesia Batik Sarong Manufacturer Company. Fine quality batik sarongs made of rayon fabric. Produce and wholesale by CV Maya, the manufacturer company of sarongs and pareo in Indonesia. 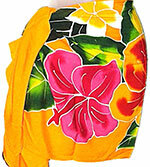 We're able to supply you with all kind of beach sarongs made in Indonesia. Rp 17,500 EXW Bali. Subject to change. All sarongs with fringes. 1st Grade Rayon. Comes in many colors. Finish adding these Batik Sarongs to your shopping cart? Please click "Add to Cart" only once. Do not double click ! Mini Skirts, Batik Pantaloon Beach Wear, Beaded Footwear etc.